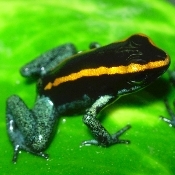 P. vittatus originates from Costa Rica. The vittatus is a smaller frog that does well in groups. The vittatus is also a bold and colorful frog with a beautiful call. They are aggressive feeders and will tackle prey much larger than the typical dart frog (anything they can physically subdue in fact! ).